I found Oakdale Cheese in 1992 at the San Mateo Farmers’ Market, which i discovered when i started working at Oracle. This was also when i first started frequenting farmers’ markets and getting to know vendors, so Oakdale Cheese may be my oldest vendor. The first Oakdale product i ate was their quark. I’d eaten quark when i was in the Army in Germany in the mid-sixties but had not seen it in this country. I just love the stuff, it tasting much like sour cream but substituting protein and lactose for all but a very small fraction of the fat and thus actually being good for you. In recent years i’ve bought at upscale groceries other brands of quark, but Oakdale’s is the best, and cheapest, so i still buy it avidly at the Marin Farmers’ Market, where Walter and his son John alternate manning the stall. And of course by now i’ve sampled a number of their other products and regularly buy their aged Gouda and quark brownies. After twenty-something years of eating their cheeses, i finally tried their smoked Gouda and was astonished that a product i’d turned my nose up at without tasting in Amsterdam was actually delicious. When Walter first started selling the aged Gouda, his production was limited and he did not display it at the farmers’ market but rather, kept it under the counter for the cognoscenti who knew to ask for it. That was a fine marketing ploy for a good cheese, but now John, who’s taken over production from his father, makes enough of it that it’s on display with the rest of the cheeses. I mentioned to John that perhaps he ought to consider producing a Gouda aged even longer as a premium product, and he admitted that he’d done a few wheels of this for the family. I gnashed my teeth. See, the problem is that the wheels have to be turned over every week during the aging process, and it’s a question of manpower. Oh, and a word of warning about those brownies: don’t taste them because one bite is all it takes to hook you. For life. So anyhow, after decades of buying their cheese, i decided i’d do a visit to their store in Oakdale, especially since John offered to give me a tour of the cheese making area. 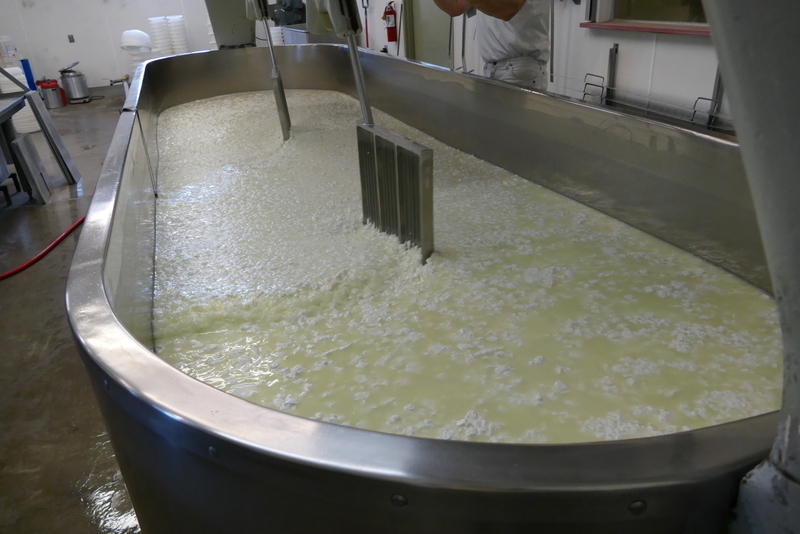 I had the wit to bring my camera and was able to hang around long enough to document the making of a new (at least to me) product, a goat milk cheddar. When i came in on the process, John had already added the rennet, and it had worked its magic under the surface. Here he is, feeling of the curds. Then he starts draining off the whey, which goes into a tank to be sold as a food supplement for the dairy cattle that provide the milk. Going full circle. And as the draining starts, he inserts into the vat machinery these grills (which i later learned are properly called “cheese knives”) that rotate slowly on eccentric cams, stirring the curds as they move back and forth from one end of the vat to the other so that over the course of a few minutes they cover every square inch of the vat. Do i love big machines or what? 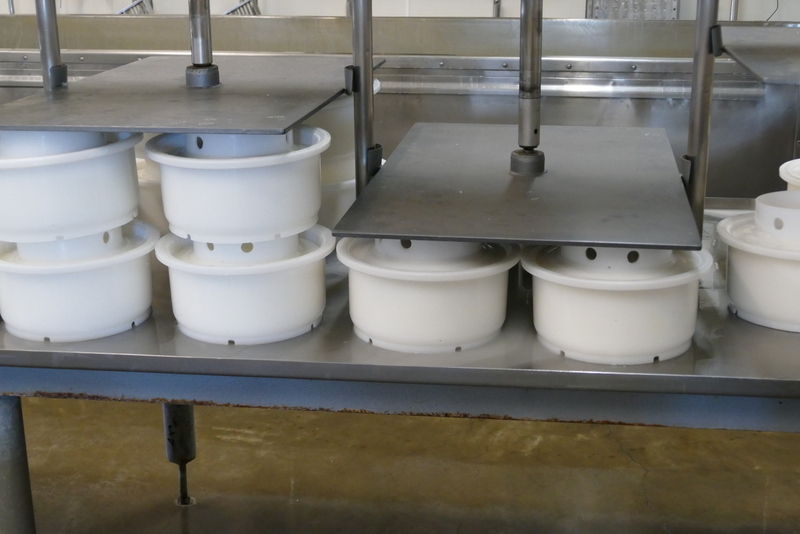 When enough of the whey has been drained off, he removes the knives and inserts baffles at both ends to squeeze the curds to the center of the vat. 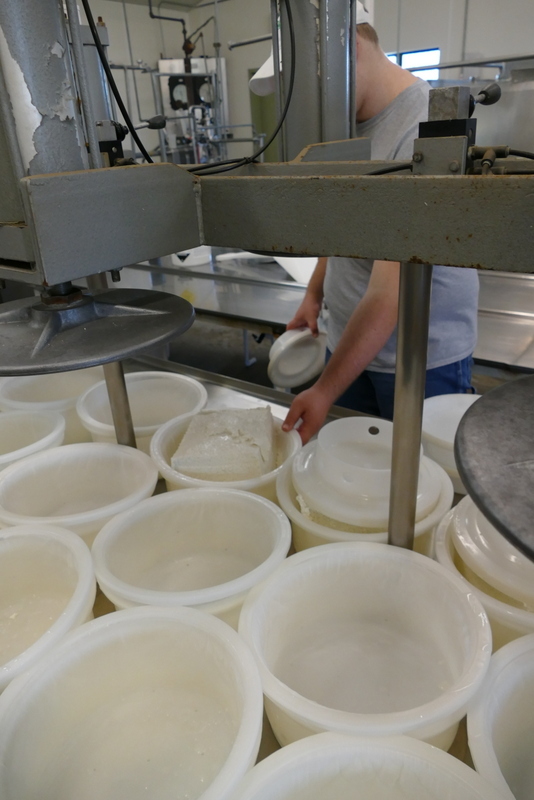 Then he puts more baffles onto the top to weight the curds down. He throws those grills on top for more weight and then for even more weight puts into the middle a ten gallon bucket of water (unphotographed owing to being too low tech). 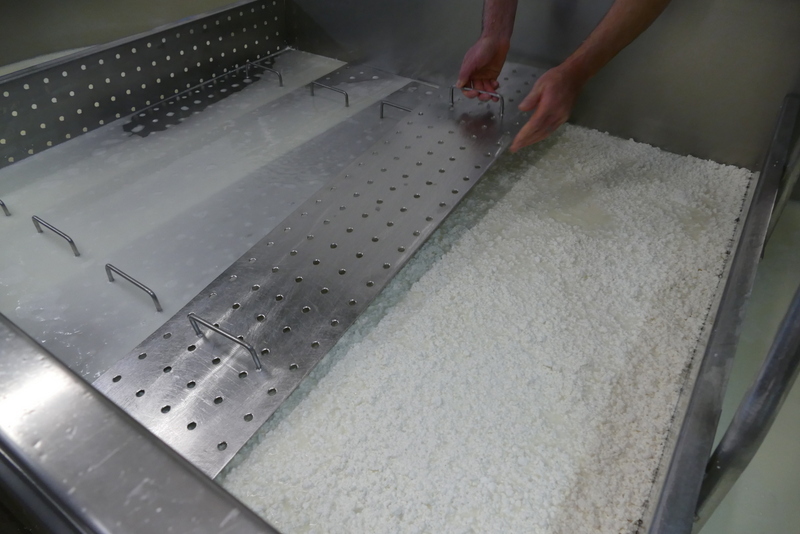 The next step is to remove all the weights and then use this square cutter to portion the curds into ten-pound blocks. He does this by feel since of course you can’t see into the whey on the surface. 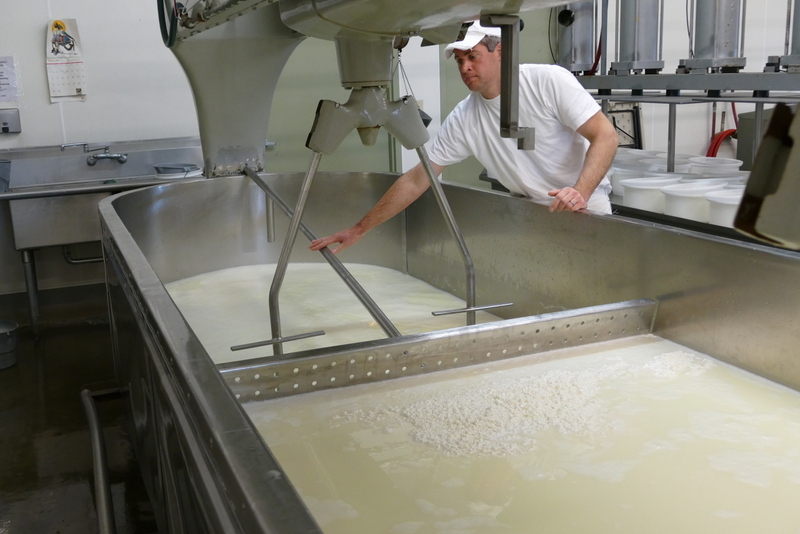 Meanwhile, his helper has put out rows of molds on the table across the way, and John reaches into the whey and pulls out blocks of curds. 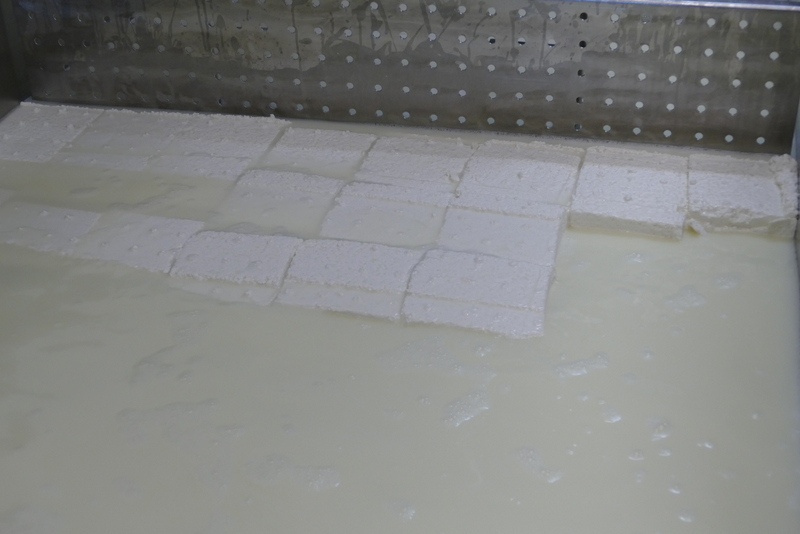 Once he gets many of the blocks out, the level of the whey has receded and you can see the astonishing precision with which he made the cuts without being able to see where he was cutting. He puts the blocks into the molds and the helper puts caps onto the tops of the blocks. 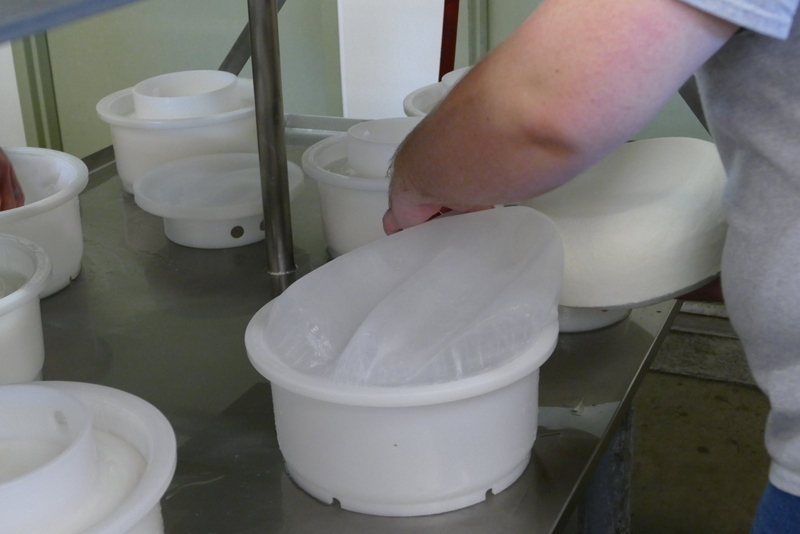 The helper stacks the molds up and puts a baffle onto the top for the squeezing process. Then the molds are pressed. 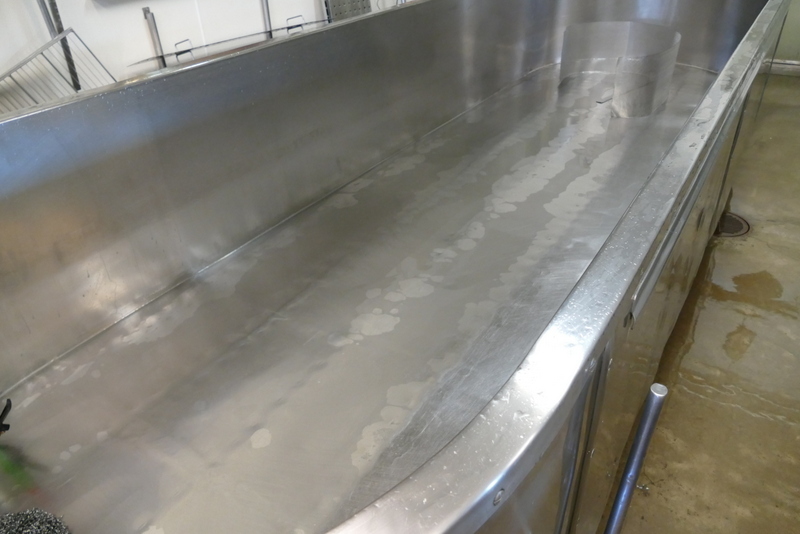 During the pressing, the vat is scrubbed clean with a detergent and sodium hydroxide, rinsed with super hot water, and is ready for the next batch. 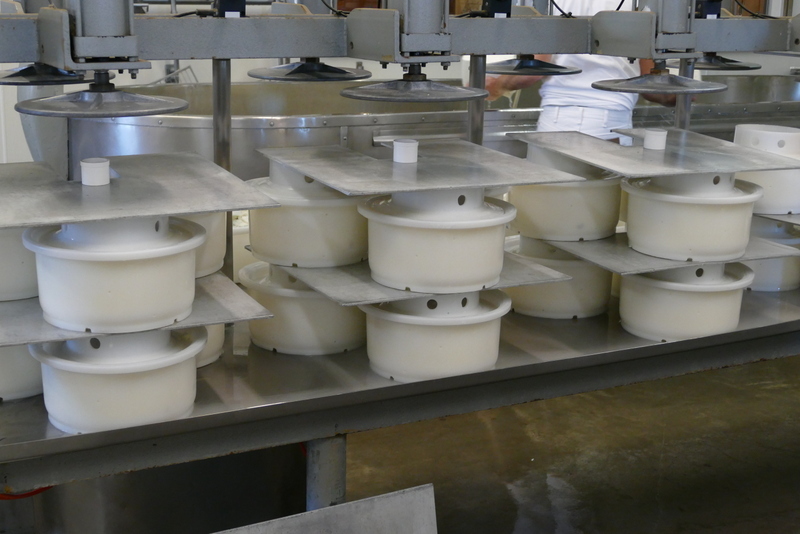 And finally, the cheeses are unmolded. John was a bit annoyed at this point because he’d used a little too much pressure in the molding process, which made it more difficult to separate the wheels from that fine mesh you see in the foreground. Looks to me like there are so many variables in play that making cheese is as much art as science. The next step is to move the wheels into a brine bath for a few days before they go onto the shelves in the curing room, but after watching all that work i was too tired to document that step. 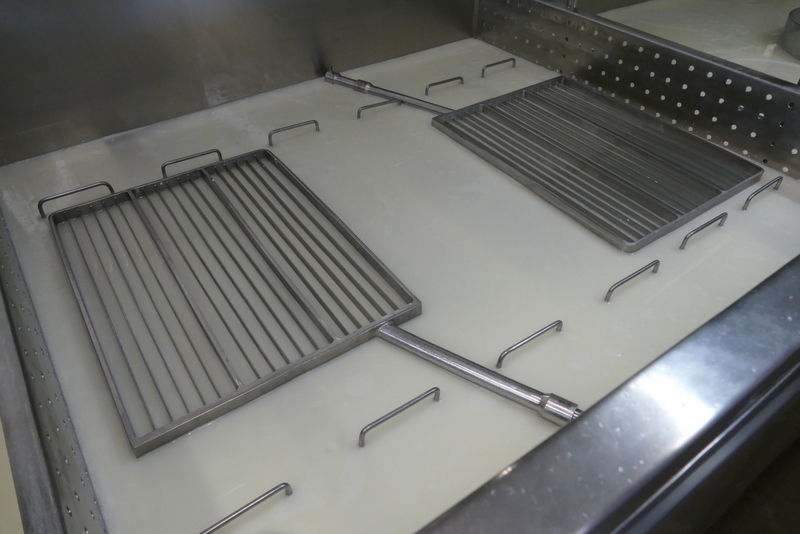 The least i can do, though, to end this essay is provide a shot of the helper waxing cheeses in the curing room. I found this whole procedure fascinating, and i highly recommend John’s cheeses. 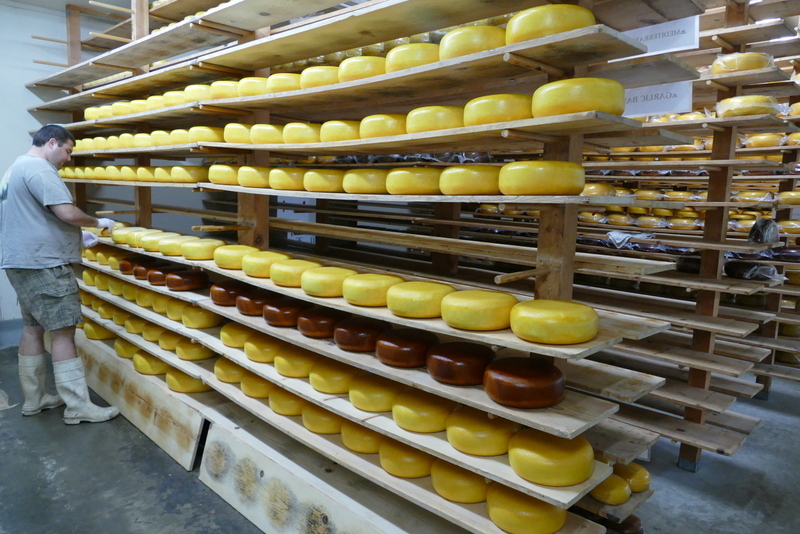 The quark is his only soft cheese, but he makes a number of hard cheeses with both cow and goat milk, mostly Gouda and Cheddar but including a variety of smoked and flavored cheeses. Tell ‘im Matte sent you and try ’em all. Late Note: As of 1 August 2016, Walter and Lenneke have officially transferred ownership of the company to John and his wife Jessica. Coda: Three of my favorite vendors have taken over from their fathers since i met them – John Bulk from Walter, Cliff Hamada from Yukio, and Eric Schletewitz, whose father i never met because it was Eric as a teenager who pioneered the family’s entry into farmers’ markets. Warms my heart that i’m following generations of them. Hell, the Yerena’s sons all helped out at the market, and their grandchildren are now making appearances. One of your finest posts…the subject, loving detail, and super photos. Congratulations!…and I’ll have to sample the Oakdale’s finest when next I see you. Thanks for your kind words. Your reward will be in Oakdale cheese, starting with the quark. Theirs is excellent, and quark is such a blessing what with the taste and mouth feel of sour cream but with high protein and low fat. You might be able to find it on one of your trips to a city in your area. Matte, had read this a few days ago but am only commenting now. Agreed that this is an excellent post. Very entertaining. And informative. I think you have a great future ahead of you writing instruction manuals. Uh, wait… what did I just say? You returned after our visit to do this terrific photo essay. Congrats! Glad you liked the photo essay but sorry i didn’t check during our visit to see whether the production area was open, not that we’d have had the three hours i spent watching the cheese making.